The LM317T is a 3-terminal integrated circuit which can supply a load current of up to 1.5 Amps with an output voltage of between 1.2V and 37 Volts. It accepts an input voltage of between 3 and 40 volts. The LM317T is available cheaply (including from the REUK Shop) and is very easy to incorporate into many renewable energy system to provide a fixed maximum current or voltage in applications such asLED shed lighting where excessive current could destroy LEDs. The LM317T can be used to regulate either current or voltage in situations where a fixed current or fixed voltage are required. The level of current or voltage required can be adjusted by connecting the chip in series with a suitable resistor. Click here to find out how to use the LM317T to regulate current in an LED lighting circuit. The concepts introduced and the circuits provided are applicable to any fixed current application, for example in our fixed-current solar battery charger. Alternatively click here to find out how to use the LM317T to regulate voltage in a circuit. 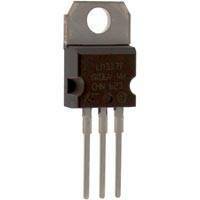 As much as 2-3 Volts are dropped (lost as heat in the regulator) by an LM317T – i.e. if the desired output voltage is 7 Volts, the input voltage may need to be as much as 10 Volts if the output voltage is to be stable. This means that an LM317 voltage regulator cannot be used to provide a 12.0 Volt output from a 12V rated lead acid battery (which will typically output 12.5V to 14V). Fortunately low dropout regulators are available, but they are of course a little more expensive. If a standard output voltage (e.g. 5, 10, 12, or 15 Volts) is required have a look at our LM2940 Low Dropout Fixed Voltage Regulator article. If you require a non-standard voltage, then click here to read ourLM2941 Low Dropout Adjustable Voltage Regulator article (adjustable voltage from 5 to 15 Volts DC set using two resistors like the LM317). Both the LM2940 fixed and LM2941 adjustable regulators have a typical dropout voltage of just 0.5 Volts and so can be used where the input voltage is just a little higher than the desired output voltage. Found your site and charts quite useful. I’d gone to the trouble of making my own a few years ago. Another device you might want to include in your post is the LM350. Minimum output current of 3A, typically 4.5A. Likely a cheaper alternative to the TO-3 case style, but TO-3.Same resistor calculations as LM317 and LM338. I’ve been using the Fairchild, but TI and the rest have similar specs. LM350 Datasheet.